New Preferences Tab: Settings related to specific data formats or manufacturers only (that is, Sony ARW2, Panasonic, PhaseOne, Sigma dp2 Quattro, Canon/Nikon sRAW/Small RAW), have been moved to the "Vendor Specific" subsection within the Data Processing settings section. Settings affecting all cameras/data formats remain in the main "Data Processing" section. 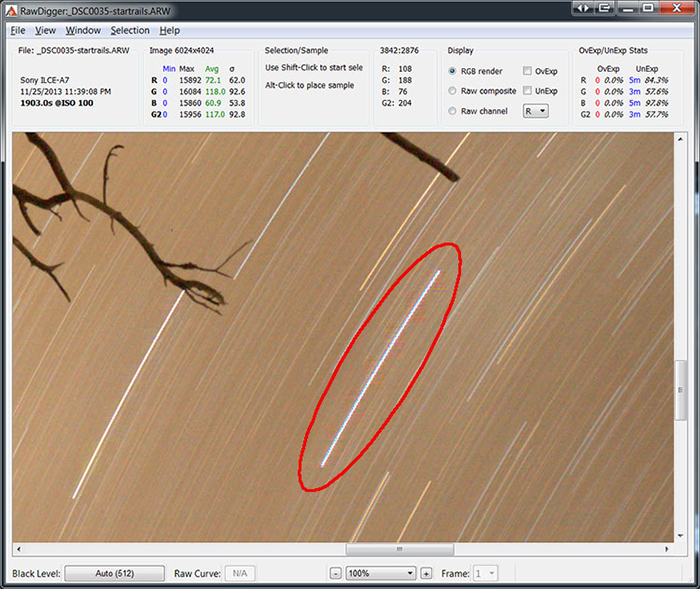 Show YCbCr data for Canon/Nikon sRAW files in Preferences - Data Processing. To disable Cb/Cr interpolation, switch on "Do not interpolate Cb/Cr channels data (Canon/Nikon sRAW)" in Preferences - Data Processing. Lossy compression of raw data is currently the only option available in Sony cameras of series NEX, SLT, RX, ILCE, ILCA, and the recent DSLR-A. 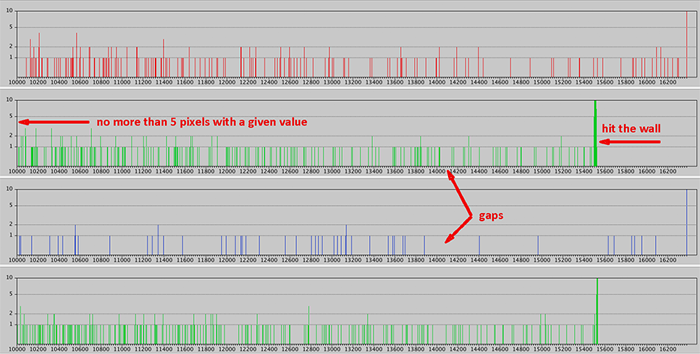 The first part of this article is showing how to detect artifacts caused by this compression. We will be discussing the technical details of this compression in the second part of this article. In the vast majority of cases, the compression artifacts are imperceptible unless the heavy-handed contrast boost is introduced. There are, however, exceptions. With some unlucky starts in alignment, the artifacts can become plainly visible, even without much image processing. All that is necessary for the artifacts to threaten the quality of the final image is a combination of high local contrast and a flat featureless background. Lets have a look at the example, which was first published by Lloyd Chambers in his blog. This mode is to display the ratio of the minimum delta step to the pixel value. For those image areas where this ratio is large and the contrasty details do not exist (like it is in the sky) the normally processed image may exhibit visible posterization. The values are displayed in per mil (a tenth of percent, or one per thousand). Different cameras, even if based on the same sensor, may render extreme highlights at around clipping point differently, and differently, with different values of clipping points, depending on ISO setting. It is important to recognize the look and calculate the practical clipping point, which is not always the same as the maximum raw value. Here we will try to demonstrate the typical “looks” of the histogram of the clipping zone. Now we are going to illustrate the different histogram display modes. RawDigger histograms: Part 1. 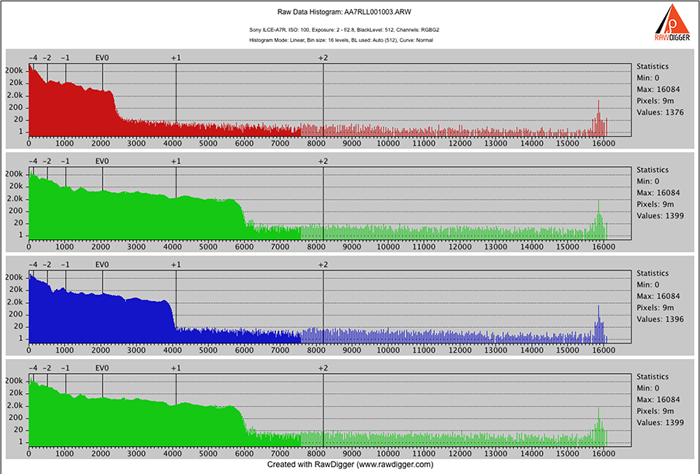 What is the raw data histogram? This article is the first of a series, dedicated to explaining what is the histogram of raw data, what are the various ways of exploring it in RawDigger, how it can help to better understand how your camera functions, and how it can aid in improving your shooting through better understanding of raw data. 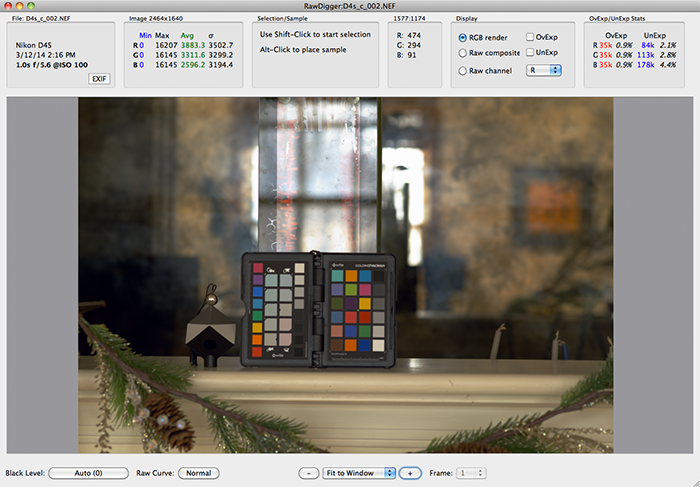 In this one, we are going show you how to navigate the RawDigger histogram. Before we get to any of this, however, let’s define what exactly IS a histogram of raw data? Note: If you know what a histogram is, and know the difference between the histogram on the back of the camera and the histogram of the raw data, feel free to skip to the next part. But maybe even if you think you know all about the histograms the below is worth reading. Read more about RawDigger histograms: Part 1. 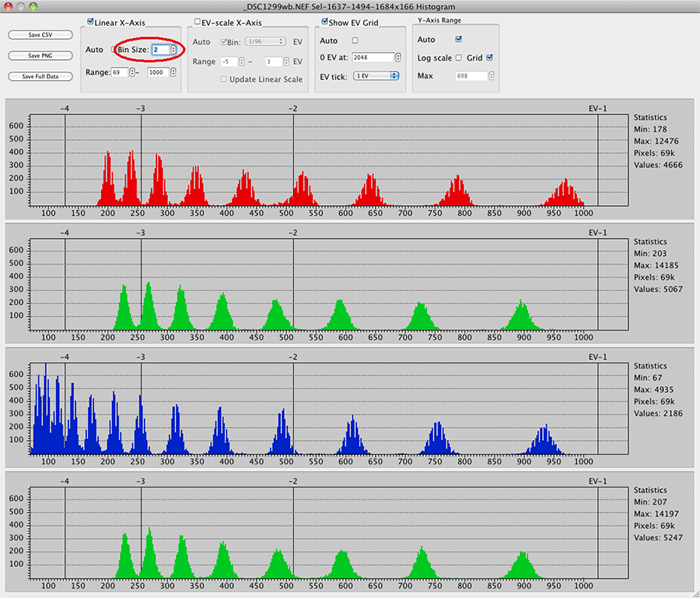 What is the raw data histogram?